Finding the best cereal for your baby that both tastes good and also is good for them can be hard. Keeping your baby as healthy as possible is always the goal as parents so finding the best products with the healthiest available options is the ideal situation. Babies have weaker immune systems than adults and eating a traditional diet that can be high in pesticides, preservatives and processed ingredients can weaken the immune system even more. Organic diets help promote a strong immune system and give them the best possible diet by providing the healthiest ingredients. 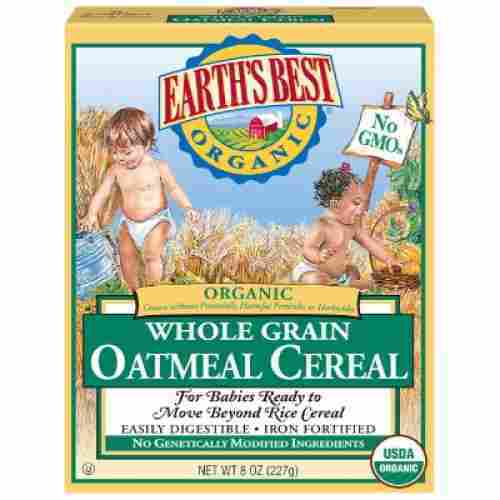 Below is a quality list of the best organic baby cereals available on the market. 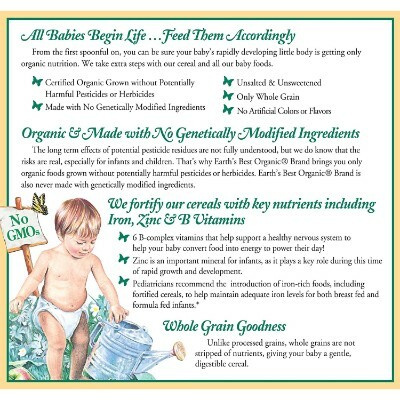 Organic cereals are good options for a first solid food for babies. 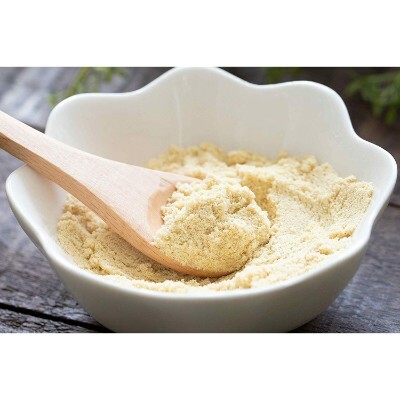 We have recently updated our list with a couple of new products and have reviewed all other product information to ensure that the ingredients, formulation, cost and availability are current and accurate. NurturMe has created one of the first pure quinoa based cereals for infants and babies. 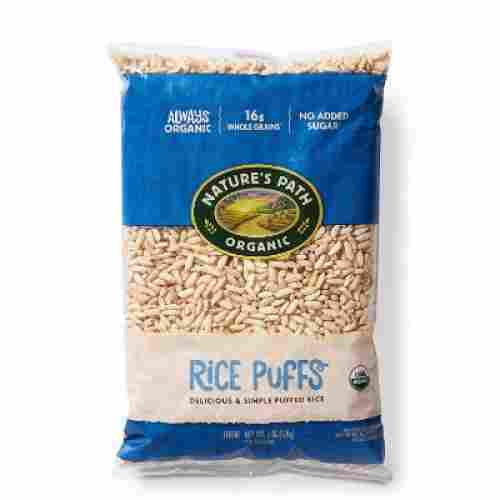 It is a great healthy alternative for traditional oatmeal and rice cereals. 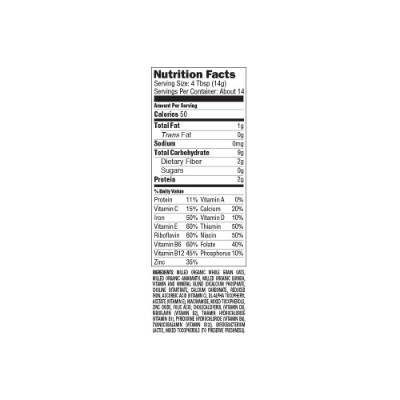 It contains probiotics with no soy, egg, dairy, or gluten. The vitamins and minerals are all plant-based and natural. 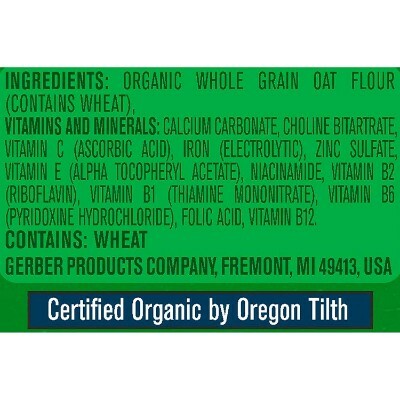 It is has been certified as organic and non-GMO along with kosher. Your little one will easily be able to digest this well-balanced meal. It is super easy to make as you will only need to add water and stir. Designed specficially for babies, this meal is gentle on the tummy. Everyone seems to love cereal, but babies and young people seem to love it even more. This cereal has been made from simple ingredients to create a wholesome and tasty treat. 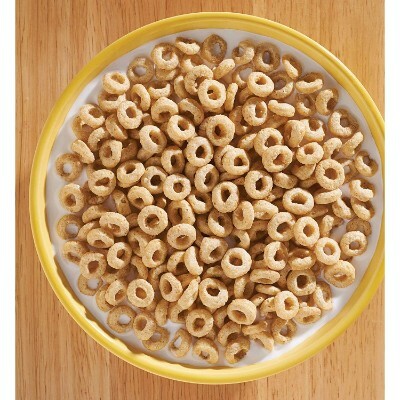 Created with whole grains and oats, the O’s are toasted to perfection and also contain almonds, honey, and lots of goodness. 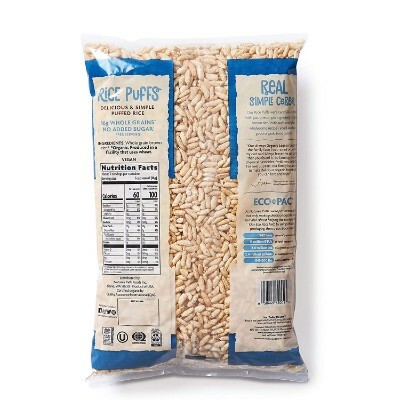 Each serving contains 13 grams of whole grains and is cholesterol-free. The company is both certified USDA organic and kosher plus features the seal of Non-GMO Project Verification. 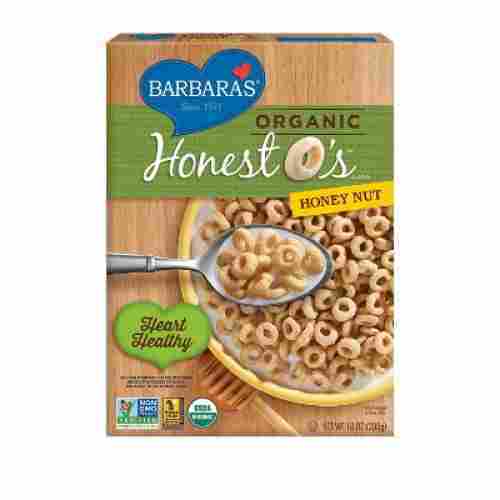 If you are looking for a simple cereal that can be used as a snack or a wholesome breakfast, a bowl of these O’s will do the trick. This cereal is great for children of all ages as it is composed of healthy ingredients and easy to eat. The perfect first solid food for a baby should be a cereal that is easy for them to digest and make their belly happy. This organic probiotic cereal is perfect. It is enriched with Iron and Choline. 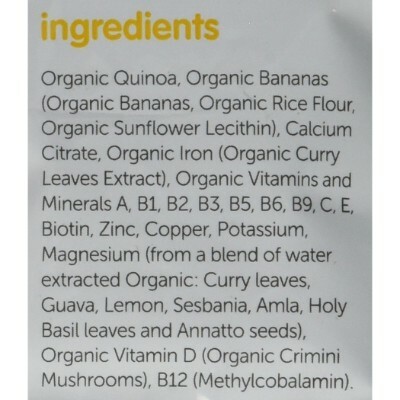 Those ingredients are great for development and supporting a healthy digestive system. It is easy to prepare, just simply mix with breastmilk, water, or formula to the consistency that you are pleased with. 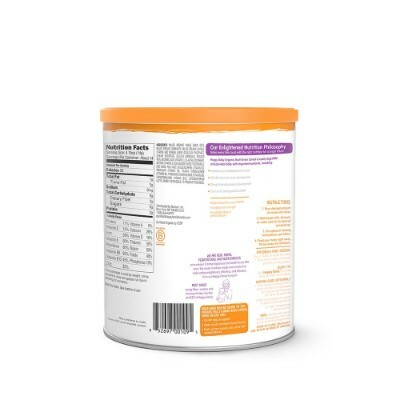 It is easily digested plus you know you are providing your baby with the nutrients that they require with each bite. It is best suited for babies four months to six months. Providing your baby with all the supplements that are needed to develop their brain is very important at this stage of life. Iron has been added to this cereal to provide the perfect amount for proper development. Known the world over for its unique baby nutrition in small jars, Gerber’s Organic Single Grain Oatmeal Cereal is something that is quite unique. Instead of using a variety of ingredients to create a highly nutritious mix, Gerber found it more beneficial to focus on a single ingredient. 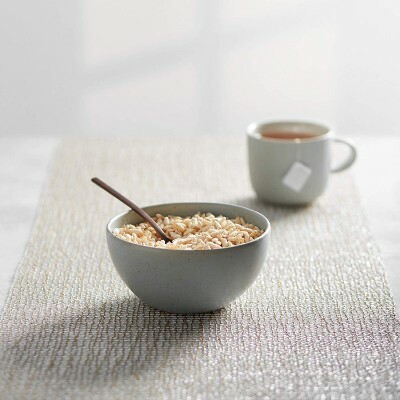 The Single Grain Oatmeal is sourced from a certain variety of organically grown oats (Avena sativa) in California. Oats have an excellent nutritional profile that includes B-vitamins such as thiamine, pyridoxine, niacin, pyridoxine, cyanocobalamin, riboflavin, and folate. 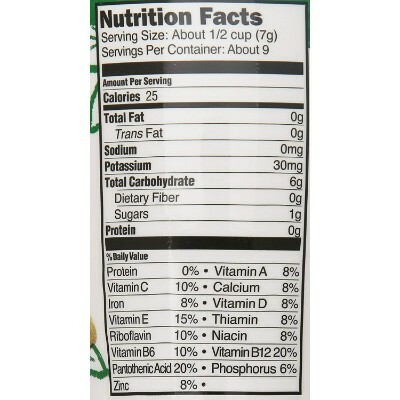 Additionally, it also contains Vitamins A, C, and E which help in visual development, immune system enhancement, and optimum cell and tissue health, respectively. Preparing this for your child is super easy as it can be mixed with water or a puree. 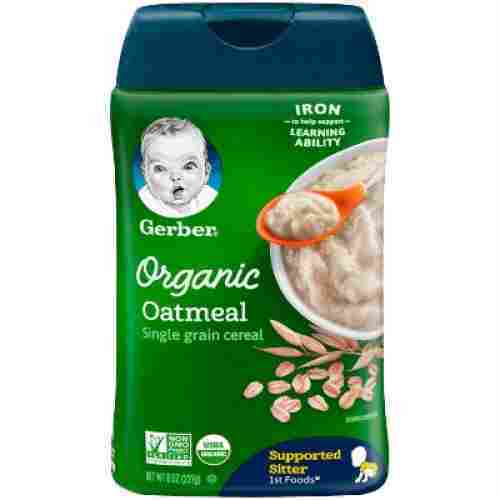 This single-grain oatmeal cereal by Gerber fills up your child enough that they can last four to five hours between feedings. Unlike traditional cereals, this won’t lock up their bowels, as it’s easy for your little one to digest. As your baby gets older, you can mix it in with some puree of blueberries, strawberries, etc. 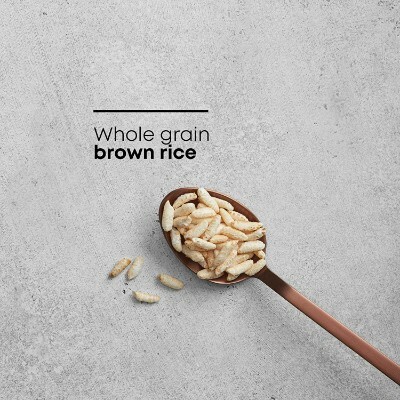 What an easy way for your little one to enjoy the goodness of brown rice with this crunchy and light version of the cereal. 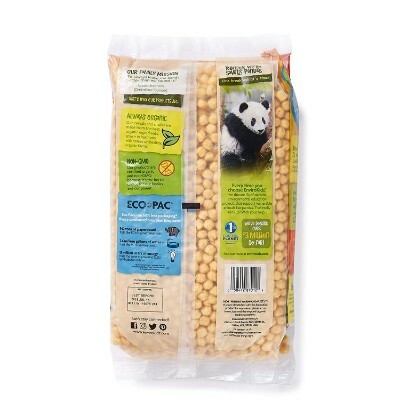 This product is USDA Organic, Vegetarian, and Verified for Non-GMO. 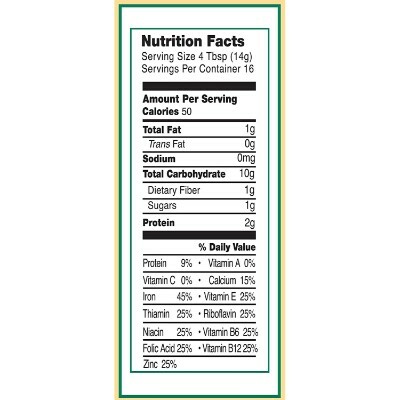 It contains whole grains, fiber, along with protein. Nothing has been added to the recipe, no sugar or salt. Products that contain no sugar or salt with simple ingredients are great for babies. 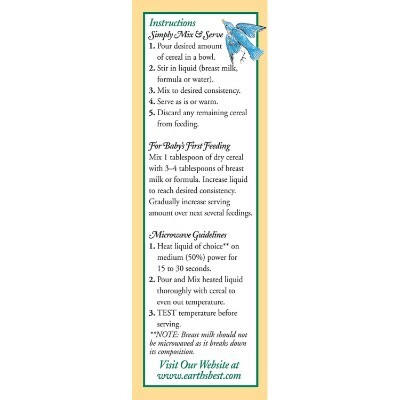 They provide the nutrients that they need without any additives or preservatives. One of the most important and well-documented minerals that plays a significant role in the development of babies’ central nervous systems--including the normal functioning of the liver, the muscles, and the different nerves of the peripheral nervous system--is choline. This is one reason we deemed it necessary to include the Organic Probiotic Baby Cereal with DHA and Choline on our list. 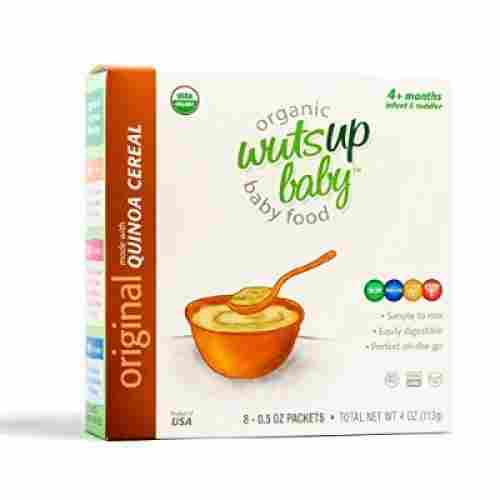 This baby food contains chia seeds, quinoa, and amaranth to provide your little one with high-quality iron, fiber, and protein. This is in addition to the various minerals and vitamins as well as tocopherols and fructooligosaccharides to help provide your child with all the correct nutrients he or she needs as they grow. It contains calcium for strong bones and iron for healthy blood. These help facilitate the more-efficient use of energy so your baby can start exploring his or her surroundings. 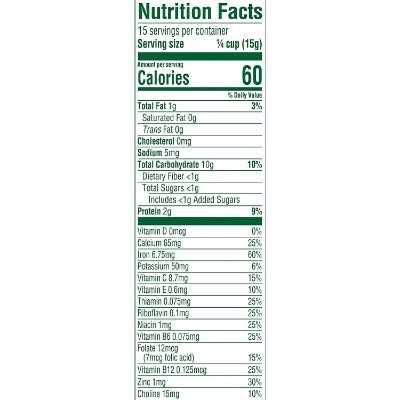 It contains no corn syrup, no trans fats, no artificial sweeteners, and, more importantly, no GMO-associated ingredients. 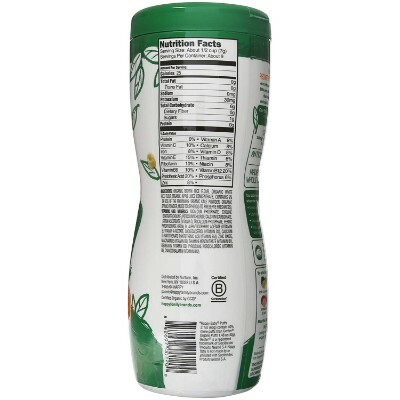 It’s 100 percent organic with a packaging that is made of BPA-free materials. When mixed with fruit, it becomes even better. It’s soft and easy to prepare, making it a plus for parents and babies. Even the pickiest of babies will love this. 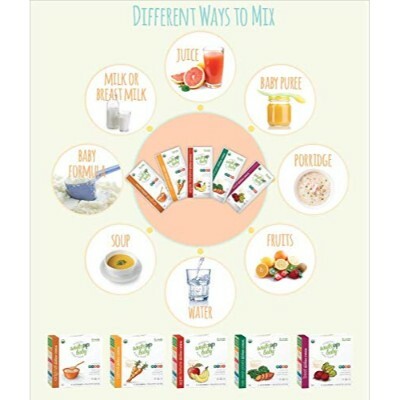 As a well-known brand, Happy Baby has kept proving their adeptness at organic baby food. 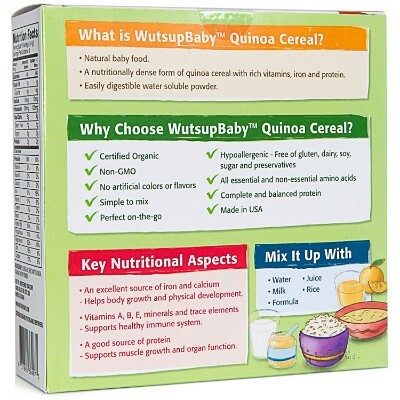 This cereal is great for babies who are just starting to try out solids. 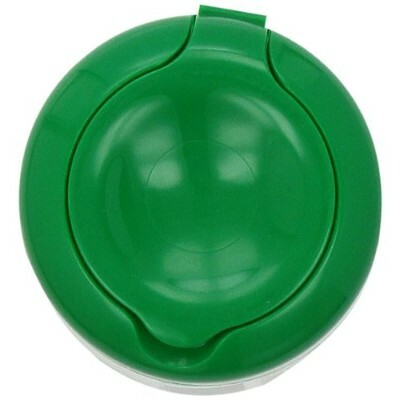 If you are careful with the things your baby eats, consider this great product from Envirokidz. Give them an alternative to the popular, but sugar and preservative-heavy cereal options. This product is organic, GMO-free, gluten-free, and vegetarian. 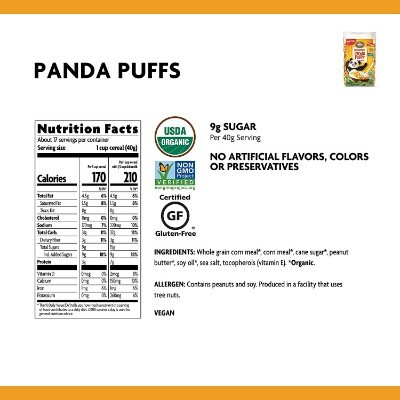 These puffs are free of artificial flavors and coloring, as well as pesticide and herbicide free. 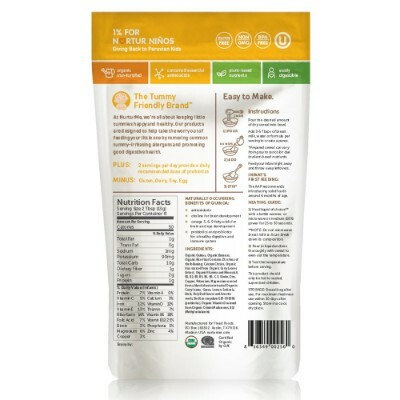 With three different flavors divided into separate 25-ounce bags, you can easily give your child their favorite snack as they arrive ready to eat. 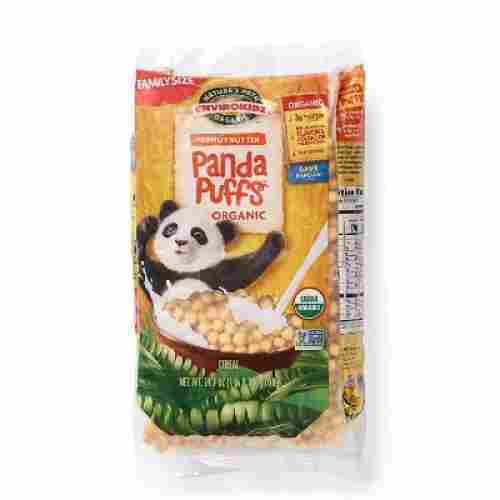 Designed as a puff, this snack is great for children who are able to chew. Easy to digest and has been fortified with iron. 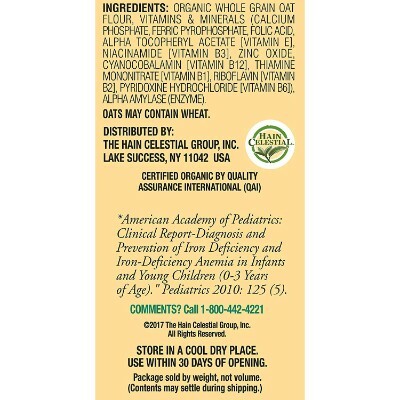 This whole grain oatmeal cereal is great for infant development and growth. The ingredients have all been grown without pesticides that contain synthetic and harmful materials. 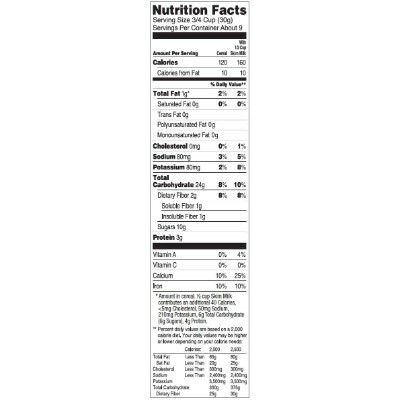 It has no salt or any refined sugar plus is USDA Organic Certified. 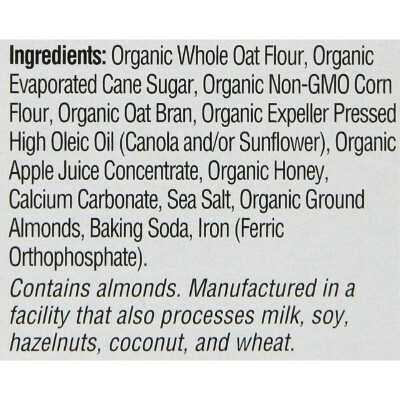 The cereal has been made with whole grains that are non-GMO and come from a farmer that is certified kosher. There are no artificial flavors, no artificial colors, and have not been grown with any herbicides. This brand is pediatrician supported nationwide. Moving from rice cereal can be hard for infants and their digestive system. This easily digestive oatmeal cereal is a great way to introduce a new cereal without the tummy aches and pains. 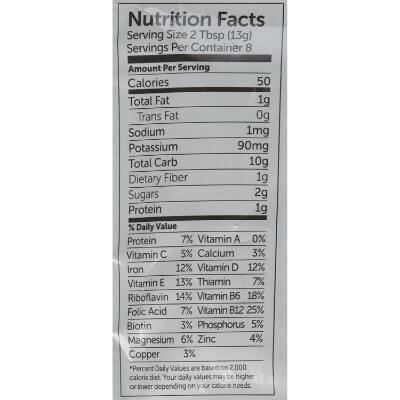 It is easily digestible plus contains fortified iron. This is a great snack to introduce to your child who is ready to move past rice and cereal. Every parent wants nothing but the best for their baby especially when it is their first food. This cereal has been created by a team of health-focused professionals. They have created the cereal as a superfood for babies. 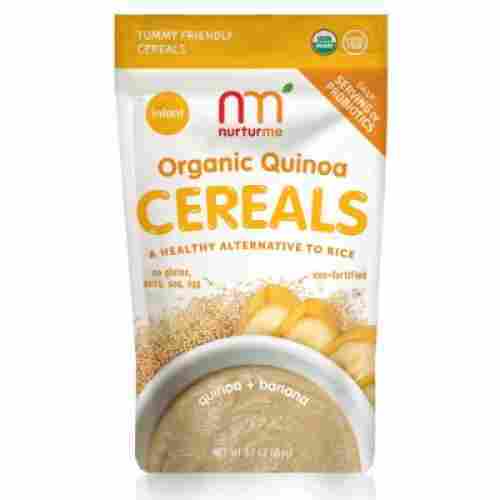 It is packed with nutrients and quinoa is the base of the cereal. Travel packs have been created to ensure that parents can still provide their children with a nutrients meal while on the go. Using this cereal allows parents to be able to give their child a meal without having to subject them to unnatural fortified food that would come from a tube. Simply mix with a liquid or mashed fruit or vegetable and a meal has easily been created. 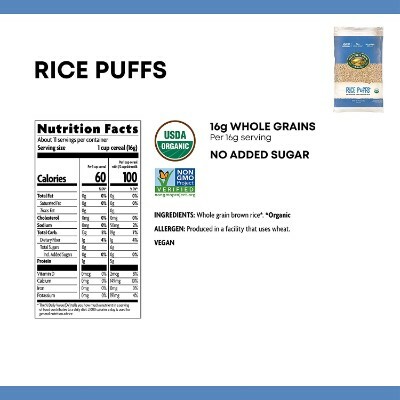 Available in a set of 6 different flavor combinations, the Organic Puffs from Happy Baby is one unique nutrition system for growing and developing infants. All Happy Baby Puffs variants contain 20 milligrams of choline. Additionally, the Puffs contain 10 percent of your child’s required daily intake of Vitamin C and 15 percent for Vitamin E.
Making the transition from purees to solids isn’t easy for babies. 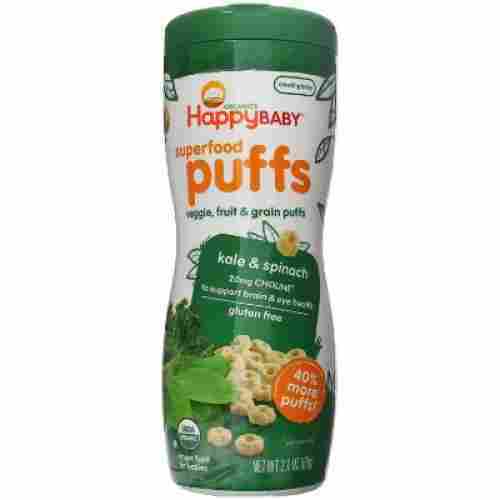 However, these Happy Baby Organic Superfood Puffs make it a breeze. They melt fast and are great for babies that are working on pinching and grasping fine motor skills. Though they only last seven days once the seal has been opened, your babies will love them so much that the expiry date won’t be a problem. Choline is a very important mineral for optimum central nervous system functioning and development among young children. It is also important for excellent eye health to help enhance the development of visual motor coordination of growing infants. In choosing the top baby cereals, we had to make sure that the product is sourced from organic ingredients. We know that organic food products are safer than those that have been grown or cultivated in the traditional way. These should thus, be free from any trace of harmful chemicals or substances that may have been used in its production. So, we had to carefully check the reputation and trustworthiness of the company. This is crucial because it is very easy to put a label of “organic” on any product even though, in reality, it is not really 100 percent chemical-free. The only way we can ascertain the validity of these claims is by comparing them to the overall manufacturing practices of the company as well as their level of trustworthiness. Nutrition for infants is a very tricky issue especially for those of us who don’t have a degree in nutrition and dietetics or even in child developmental nutrition. In creating our list we wanted to include foods that are easy to prepare and can easily be digested by your baby. Different foods should be introduced to babies and different times during their development. There are some foods that might not be appropriate for certain age groups. As parents, it’s up to us to make some of the most important decisions regarding the food our child eats. Food habits, tastes, and preferences happen early on in a child’s life. So, many choose to start them off with the freshest and healthiest options that are available. Throughout this list, you might have seen us mention about the different baby food stages. While shopping for food for you baby, you will encounter these a lot. So, it’s important to know what they mean and what each stage stands for. Stage 1: This stage is suited best for babies that are aged 4 to 6 months. The foods in this stage are mostly limited to purees that are made with a single ingredient. They do not contain any complicated or lumpy textures, nor do they contain dairy, eggs, or meat. Stage 2: This stage is for babies aged 6 to 8 months. The foods in this stage are based on grain, vegetable, and fruit blends. There might be two to four ingredients and the texture is more likely to be varied at this stage. Stage 3: This stage is for babies aged 8 to 10 months and older. The foods in this stage start to get more complex with various foods and textures now incorporated. They may contain eggs, meat, and dairy. It is possible that the food might also contain soft chunks. If your child is exhibiting chewing motions they may be ready to be introduced to solid food. Some cultures don’t necessarily believe in separate baby food and feed infants food that is prepared and cooked for the entire family. Remember, that this is the first time that your baby will eat solid foods. That is why it is essential to introduce food items one at a time, helping build the palate of your child through the discernment of different tastes, aromas, and textures. For example, if you give your baby your adult mashed potatoes complete with salt, butter, black pepper, and even milk, you are technically introducing so many flavors at the same time. Young kids won’t be able to differentiate salty from sour, sweet from bitter. What they will learn is the flavor of “mashed potatoes.” In addition, if your baby develops an adverse reaction to the food, a blend of different things will make it hard to figure out initially what he or she might be allergic to. It is for these reasons that baby cereals are deemed the best for introducing solid foods to babies. By the time your baby has mastered the taste and texture if his or her food, then he or she can be given another flavor and texture until such time that he or she can already discern the difference. q: Why do these prices vary so much? These prices are either set by the manufacturers or Amazon (in the case of the links we provide). So, we have no control over how much an item costs. You might be able to find lower prices on other sites online or even in stores. q: What is so great about organic foods? 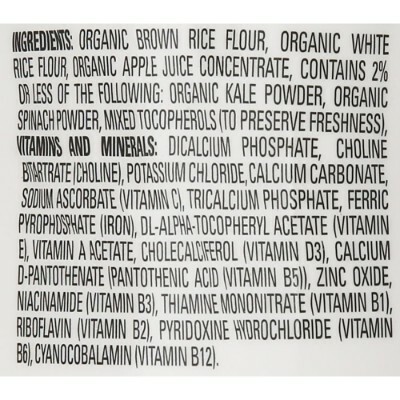 Organic food needs to meet USDA’s strict regulations in order to use the organically certified sticker on the product. This ensures that the product that you are purchasing has already been through thorough examinations. They will not be sprayed with chemical pesticides, nor will they contain any artificial preservatives, colors, or flavors. q: What if my baby doesn’t like some of these flavors? We have tried our hardest to include a wide range of products that will suit most, if not all, babies. Even the pickiest of eaters will find something to their liking on our list. q: How do I know if the product is good for my child? All the products on our list are organic. As mentioned before, they will have met a set of strict rules that are administered by USDA. This means that the products on this list will be good for your child. None of them have any preservatives nor do they have any artificial colorings. Some of the products are even gluten-free and kosher. q: How come some of the products aren’t “traditional” baby cereals? As the world moves more and more toward organic food, the style of food is also constantly changing. We decided to include a range of products that are not traditionally considered cereals. This way, we can cater our list to a range of customers, who might all find something to their liking. q: How come all the products say that some babies might not like it? We can’t claim to know all babies and their likings. But, we can let you know that some of these products might not be suitable for picky eaters. Each child has different taste buds and preferences for what they like. Most times, you will have to do a bit of trial and error to find their favorites.